For the 4th year the Fieldcontrol powered by Carhartt will take place in Portimão/Portugal with a total price money of 3.000,00€ for Stunt Man category. At 18th and 19th September some of the best flatland riders in the world will be all together in Parque da Juventude to enjoy flatland in her maxim, with the same excellent conditions as last year, as an OSD wood floor with 20m by 20m covered by a 900m2 tent. 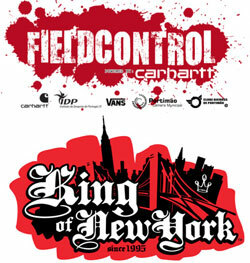 The King of New York BMX and Skateboard action sports event returns for its 16th year on August 7 and 8. Tompkins Square Park at 10th Street and Avenue A in lower Manhattan will host The King of New York.